But I can't enter this in the options window, everything after | is ignored. Try the 64-bit version (!!! ), set the LS command type to "Busybox ls" and set the following parameters: -lpa --full-time . The 32-bit version is very old, probably 8.0 or even older. I think that, despite "[Windows x32]" link label, zip contains updated both 32 and 64 plugin builds. Last edited by kulmegil on 2018-03-09, 11:31 UTC, edited 1 time in total. PS, don't forget to select "Native 8.1 ls -la" in the plugin settings. -F	Append indicator (one of */=>@|) to entries. File with "*" indicator fails when I want to copy this file from Android to Windows (using busybox ls -laF --full-time --color=never). It will be also better for non-busybox ls where -p and -L parameters are missing to show symlinked directories. Do it is possible to add a option to set other that "ADB binary path" also "DOS Shell binary path"? It seems to perform the mount command but does not work. Any chance this command busybox rm -f "/system/priv-app/SamsungCamera8/SamsungCamera8.apk"
Could you add the prefix to all the commands like below as I think this would work. su -c "busybox rm -f /system/priv-app/SamsungCamera8/SamsungCamera8.apk"
Info: , ADB Write: shell:su -c "busybox mount -o remount,rw /system"
Info: , ADB Write: shell:busybox rm -f "/system/priv-app/SamsungCamera8/SamsungCamera8.apk"
Info: , ADB Write: shell:ls -l "/system/priv-app/SamsungCamera8/"
Using latest version 8.3 of plugin on total commander 9.12. My device is xiaomi mi5 with lineage os 15.1 (oreo). Directory names containing space are not shown correctly in Total commander window - it shows only last word of name. 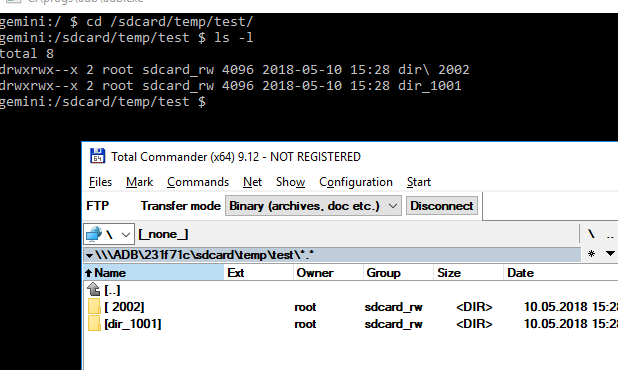 One directory name is "dir_1001" the other is "dir 2002"
and the second one is displayed as " 2002" in total commander. What is the meaning of the command line that starts the plugin? Hi since I updated the ADB plugin to 8.3, all the special folders like [ app, backup, clipboard, ...] are show the regular icon of tc and not the custom icon that they have before. Have you removed those icons? I have a Oneplus 3, and today I cracked the screen, of course, accidentaly. Before I reset all my data from my mobile and send my phone to repair without working LCD panel, can I run an SMS backup program somehow, or how can I backup my messages ? It has been installed on my phone , but I can reach my phone using Total Commander ADB plugin only . I haven’t got root access .